The Ag Data Transparency Evaluator is a tool designed to help farmers understand how their ag data is used when signing up with technology providers to use precision ag products. Companies must answer a set of 10 questions to determine compliance with certain core principles for ag data ownership, consent, and privacy. Products are reviewed by a third-party administrator, based upon the answers to the questions for transparency, and then awarded use of the “Ag Data Transparent” seal if approved. 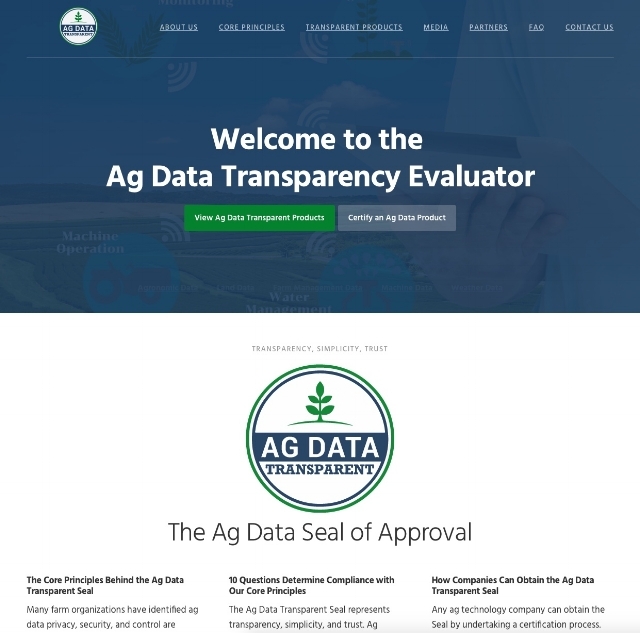 Since the Ag Data Transparency Evaluator effort was launched at Commodity Classic in 2016, the organization’s webpage has been hosted at American Farm Bureau Federation’s website. American Farm Bureau was instrumental in getting the Evaluator off the ground. “After our first year of operation, the Evaluator tool has grown up,” says Todd Janzen, administer for the project. “That means moving to our own, independent website, enabling technology companies to easily link and show their compliance with the Ag Data Core Principles. The ultimate winner is the farmer who can easily find background to research precision ag products,” Janzen explains. The new website allows farmers to easily review how their ag tech provider answered the 10 questions. The site also publishes the Core Principles the industry established for ag data in November 2014. To date, several precision ag products have been evaluated and awarded the Ag Data Transparent Seal: Onsite (AgIntegrated), Morning Farm Report (Agrible), FARMserver (Beck’s Hybrids), Conservis, Farmobile, Granular, FS Advanced Information Services (GROWMARK), and MyAgData (Independent Data Management). More products are currently under evaluation. To view the new website, visit www.agdatatransparent.com. For more information, contact Todd Janzen, Project Administrator, at Janzen@aglaw.us.